This is my second post today and it's another rainbow card for you. 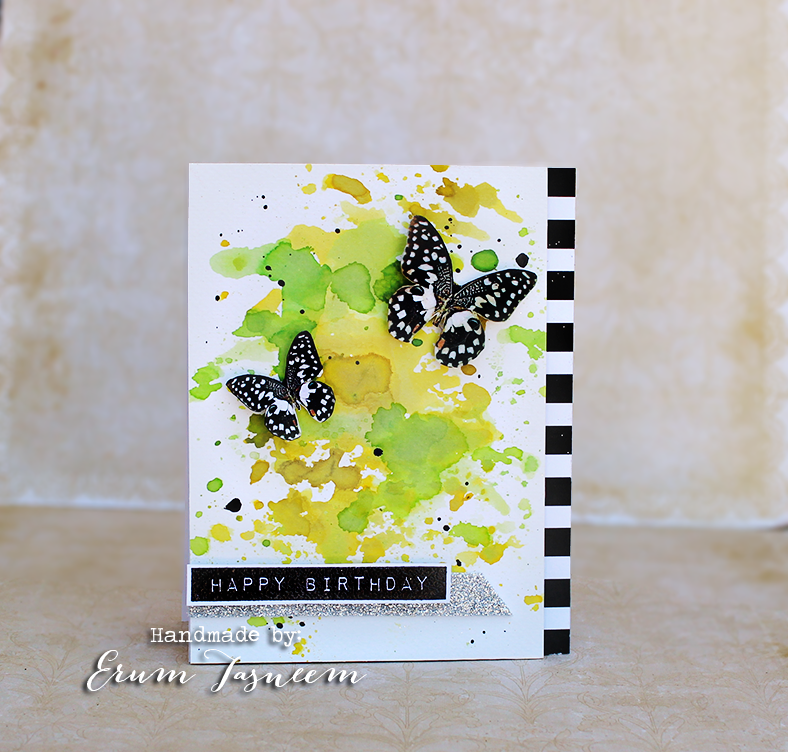 I am guest designing over at Challenge Up Your Life for June/July and this is my second post as GD. I have inked up my background using distress inks, flicked some water droplets to add texture and then sprayed it with shimmer mist. The heat embossed sentiment is from Avery Elle. If you missed my other GD post from today, click HERE. 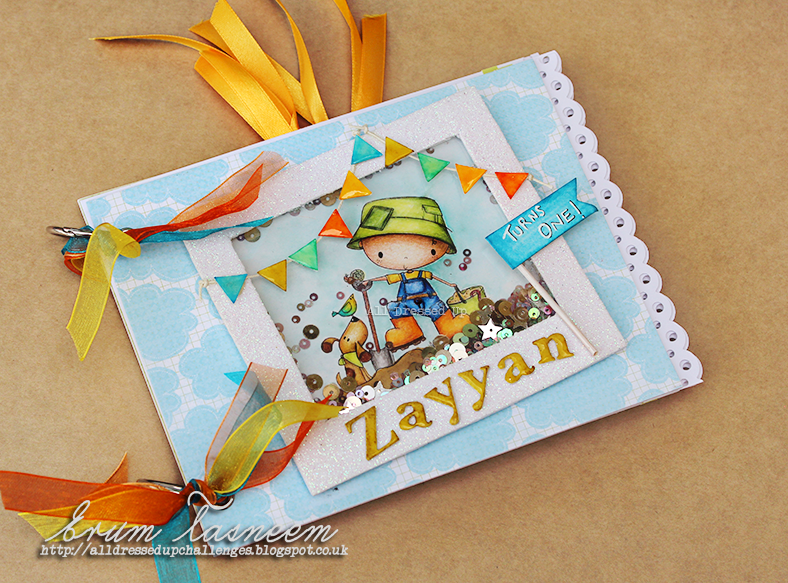 I am guest designing over at Artful Crafting today. Artful Crafting is Pakistan's first ever online craft store (a dream come true really) and they recently launched the Artful Crafting Challenges. 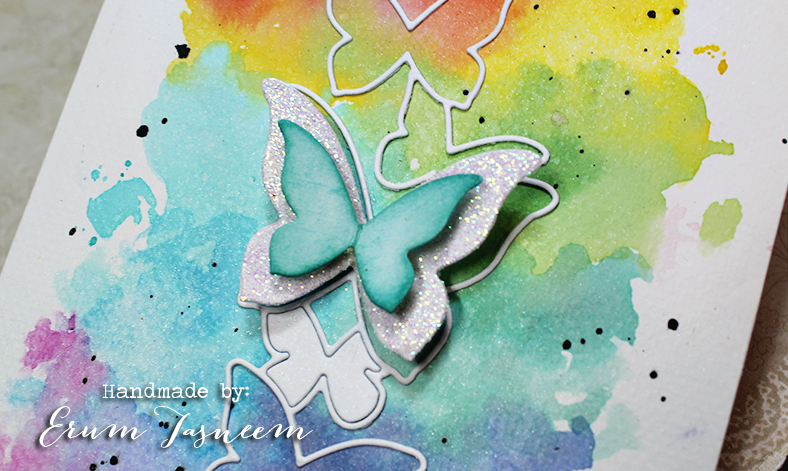 A bit about my card, I have used SSS die and stamp on a rainbow background which I created using various shades of distress inks. For those who would like to know they are as follows: Festive berries, Barn Door, Fired Brick, Ripe Persimmon, Spiced Marmalade, Mustard Seed, Mowed Lawn, Crushed Olive, Evergreen Bough, Peacock Feathers, Chipped Sapphire, Salty Ocean, Shaded Lilac and Picked Raspberry. 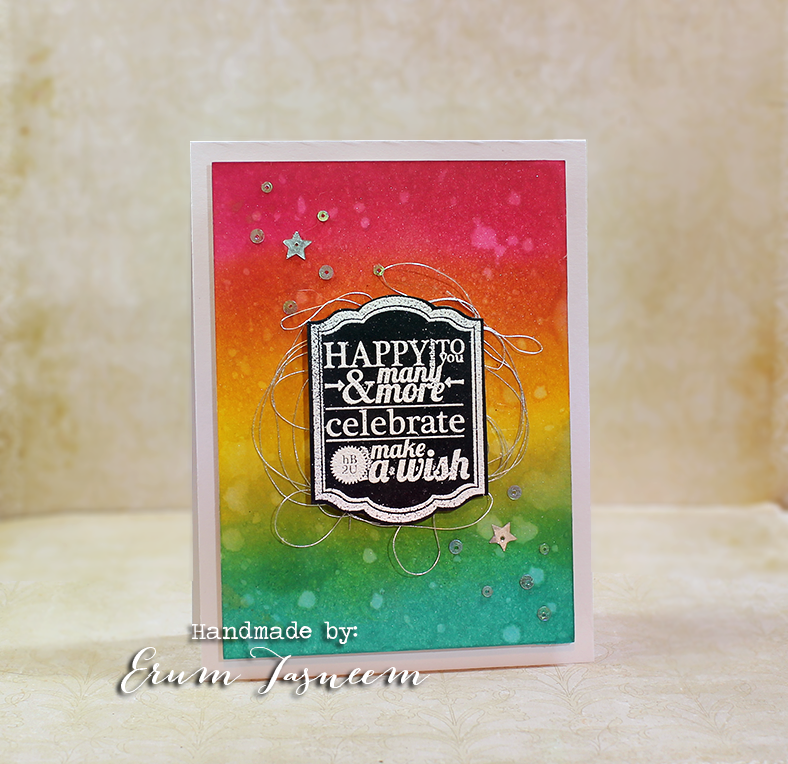 Please know you don't need all these shades to create a rainbow background, I just wanted to complete the card quickly without wasting time in mixing colors to make a new one. I have layered the largest butterfly and placed it a bit offset. Added a few black splatters to balance the bold, black sentiment. There is a ton of shimmer on the card which you cant see here but is visible in person. I have a hybrid card for you today. 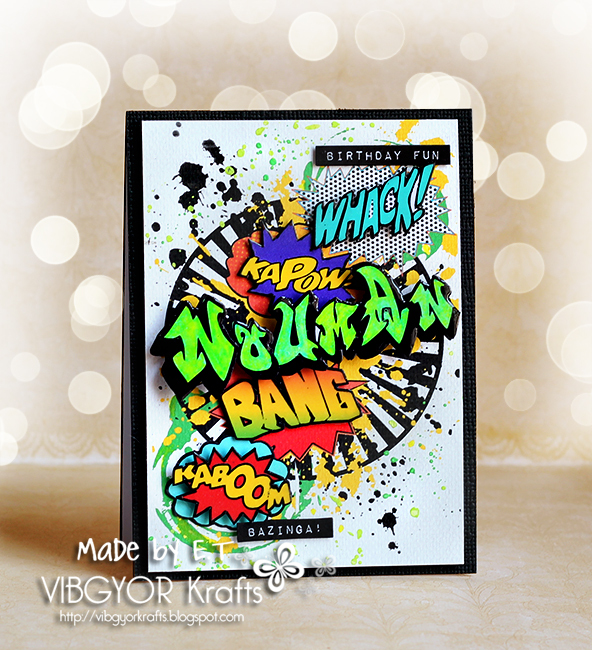 I designed this card on Photoshop for a teenager who loves comics. 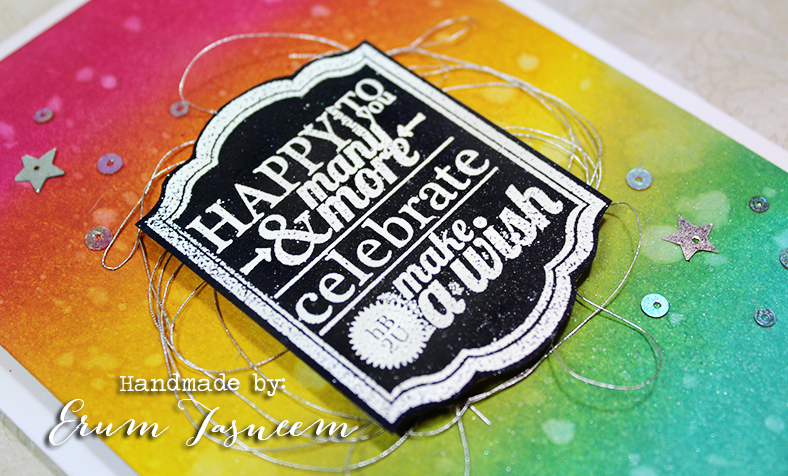 There is tons of dimension, fussy cutting and heat embossing on the card. 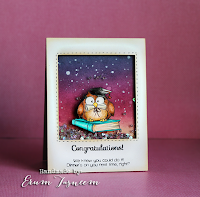 I hope you will stop by the Sentimental Sundays challenge blog and play with us. It is SUPER hot here and we are dying! I have a no line watercolor card to share with you today. All Dressed Up has a new release and there are some very cute images! I have used Little Flower Fairy. Watercolored her using distress inks. I just LOVE to watercolor and my go to coloring medium is always distress inks. Applied tons of wink of Stella on her dress and wings. Sentiment is by Technique Tuesday. I hope you like it! Please do leave feedback. 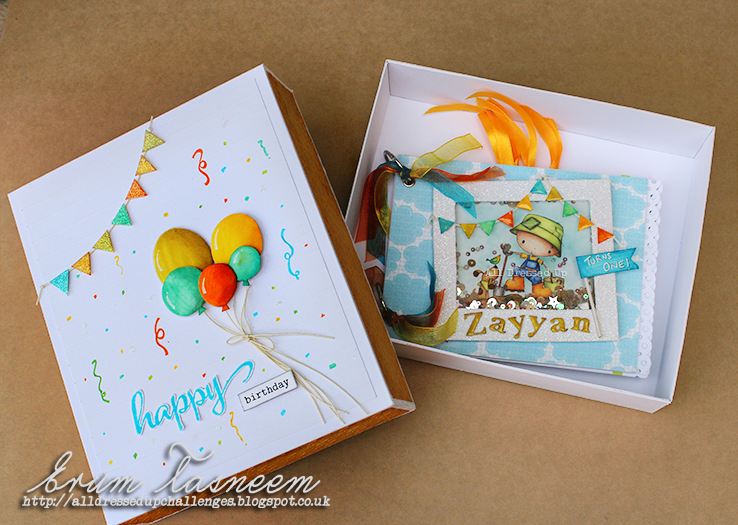 I made a mini photo album with a box for boy who is turning ONE! The balloons and pennants are hand drawn. Added some iridescent glitter on the pennants. My shaker photo album for the little kid! The image is called "Daddy's Little Helper"
I have colored him with Faber Castell pencils. Wrote the "Turns One" myself and added some shadows to it. Applied glossy accents to the alphas "Zayyan" and to the hand cut pennants. The Polaroid frame is made out of glitter foam sheet. 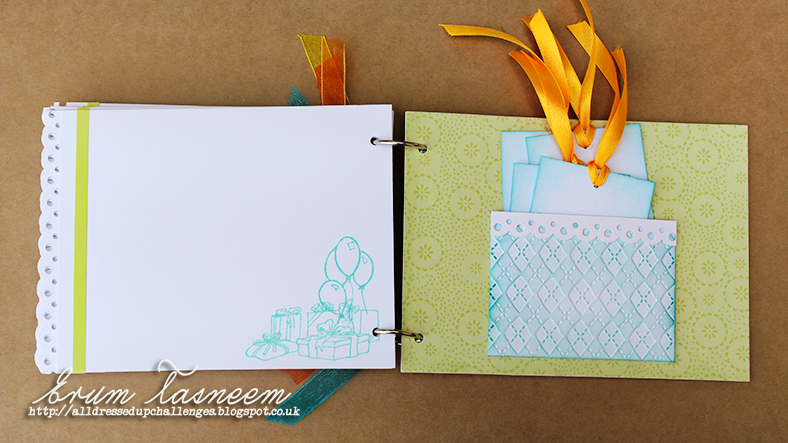 Kept the inside quite plain except for a bit of stamping on every page and attached a punched border on the edge with aa pop of green strip. The last page is a pocket page with four tags to write on. Hope you liked it! Do leave a bit of love if you did. Sentimental Sundays: YOU DID IT!!! Graduation. Before I start talking about today's card I just wanted to let all of you know that I am in the process of making my rounds, checking out your blogs and of course commenting :) If I haven't stopped by your place yet, please know I definitely will within a couple of days. The image is by "Drawn with Character" and I have coloured him using Faber Castell pencils. I thought I'd make a shaker card because who doesn't like shaker cards! The background is inked using distress inks of various colours. 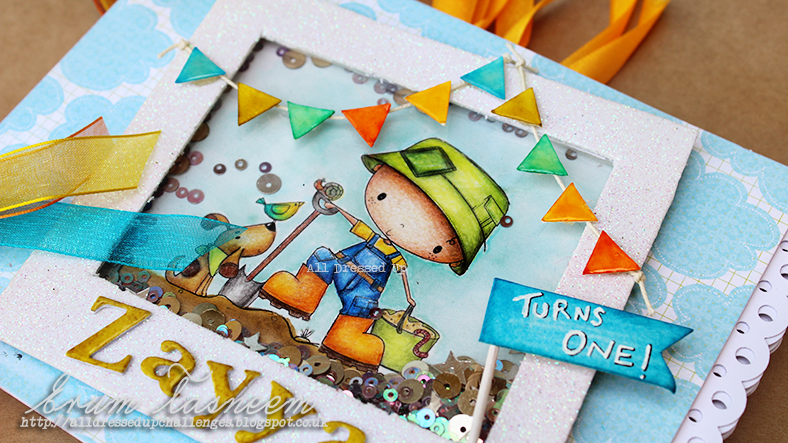 Hop on over to the Sentimental Sundays blog to check out what the rest of the DT cooked up! Challenge Up Your Life to guest design for June and July. I am thoroughly enjoying making CAS cards! 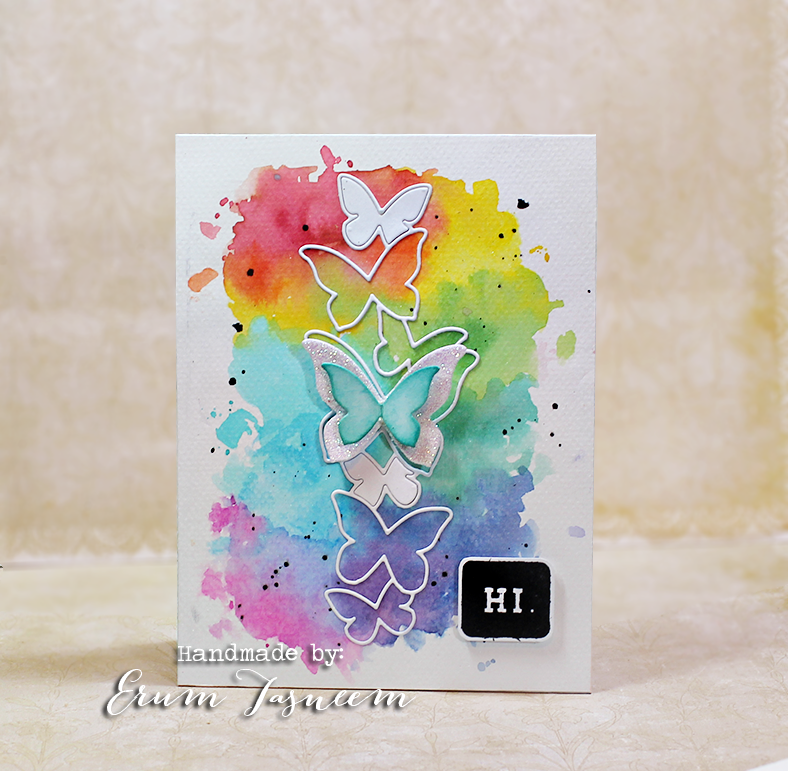 I used distress inks to create the watercolor background. Sentiment by Altenew. Please head on over to the CUYL blog to see what the team cooked up for you! 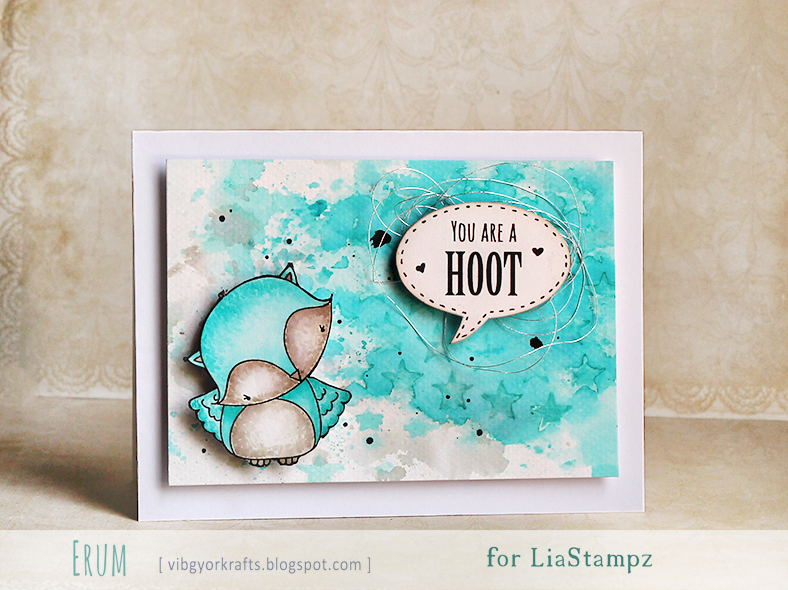 PS: Natalie S, you were the winner of Lia Stampz blog hop. Please get in touch with me sweets for your prize! Time for a brand new monthly challenge at Lia Stampz. This month the theme is Anything Goes! 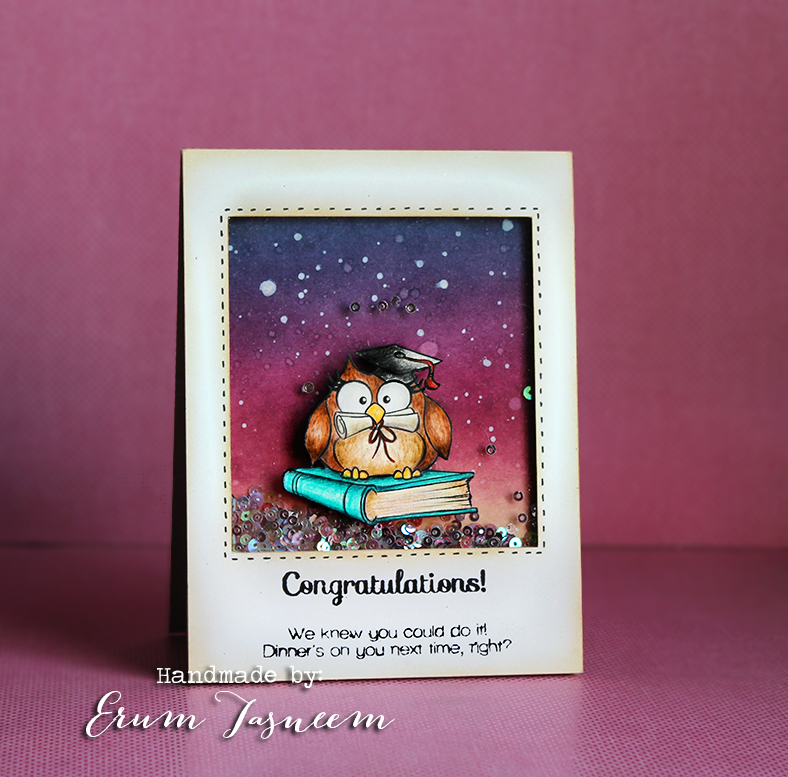 I have used Owl digi from the Owls set which you can find here. This is such a cute set! 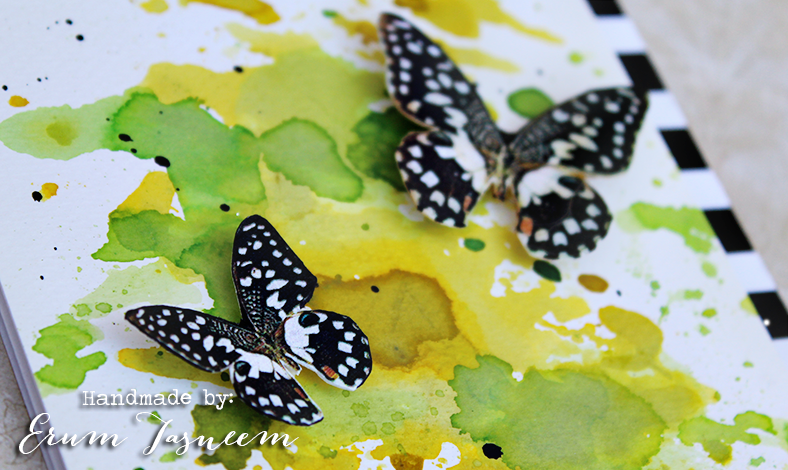 The image and the background has been watercolored using distress inks. The sentiment I designed myself on Photoshop, just wanted to keep it simple. 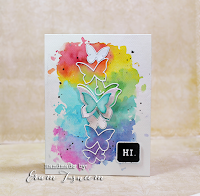 Lia Stampz Blog Hop's deadline is June 2nd! if you want to win one of your favorite flower digis. Stop by THIS post to enter.